We have been manufacturing Bow Roll, Banana Roller for different type of machines and size per client’s requirement. All type of Bow Roll Manufacturer India, this is the most commonly used wrinkle remover device. It mainly consists of bowed shaft, metal segments, sealed ball bearings, abrasion resistant, rubber sleeve etc. 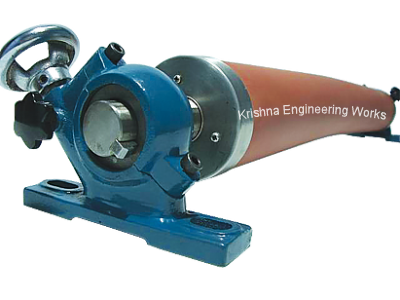 ‘Krishna Engineering Works’ make Expander Rollers (Bow Rollers) having very wide range of dimensions and suitable for equally wide range of applications and web materials. They are supplied with mounting brackets, which could be either wall mounting or foot mounting. > Rubber Sleeve Covered. (High Quality Synthetic Nitride Sleeve). > Metal Expander with hard chrome plated surface for high speed application. > Vary Bow Expander Roller.